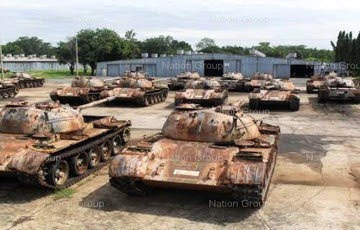 The Royal Thai Army yesterday handed over 25 tanks that were in disrepair to be used as materials for artificial reefs in the Gulf of Thailand on the shores of Narathiwat and Pattani. From yesterday to Sunday, the Chinesemade 30T692 tanks, used by the Army since 1987, will be transported to Bangkok's Klong Toei Port before being shipped off to Narathiwat. This project is meant to lend a hand to Her Majesty the Queen's moves to help the local fishery industry along the coasts of Narathiwat and Pattani as well as rehabilitate the sea in the area. Both pictures are taken from the same article by the Nation. How I wished they would drop a few of them near Samui shores and it's archipelago! Still, a very good initiative and a reason to go diving around those shores where the tanks are being sunk.